The IceCube observatory is a Cherenkov detector and an air shower array located at the geographic SouthPole. The submerged Cherenkov detector is currently the world’s largest neutrino telescope. Main objectives of the experiment are the discovery and exploration of Galactic and extragalactic sources of high-energy neutrino emission. However, the detector is also well suited for the search for dark matter (WIMPs), the measurement of cosmic rays, neutrino oscillations and several other topical questions in particle and astroparticle physics. The submerged “In-Ice” detector consists of 86 strings each equipped with 60 optical sensors (photomultipliers) which instrument a volume of 1 km3 of clear glacial ice between 1500 m and 2500 m (see the picture on the left). Neutrinos are reconstructed indirectly by the Cherenkov light emitted from secondary charged particles like muons and electrons which are generated in the neutrino interactions. Additionally, over 60 water tanks euipped with PMTs sit at the surface and act as an air shower array on the same footprint as the In-Ice detector, allowing for unique coincident event studies. 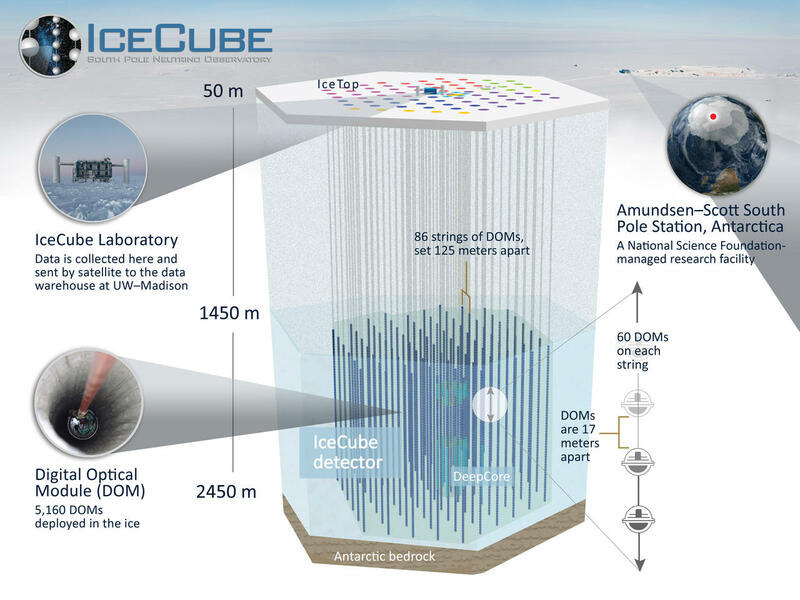 More information on the experiment and its physics can be found on the IceCube homepage. In 2013, it was the first experiment to detect neutrinos with energies much larger than a few TeV from outer space. Its origin is currently under heavy investigation, but some research highlights can be found here. 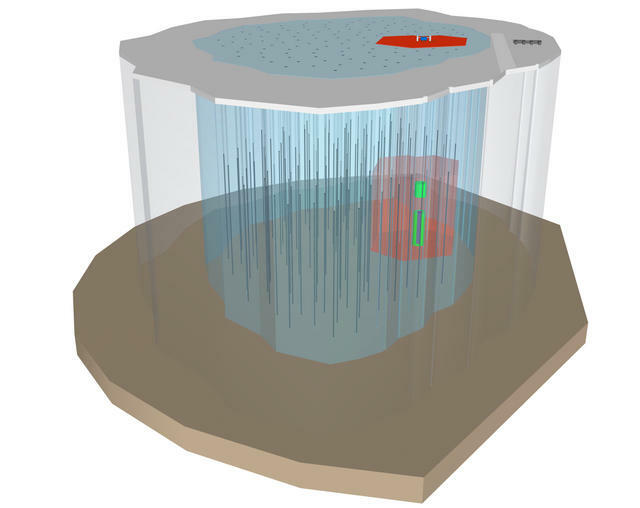 After the discovery of a cosmic high-energy neutrino flux in 2013, a next-generation neutrino telescope at the South Pole, IceCube-Gen2, is now in the planning stage that will provide extended physics potential both at the highest and lower energies. The high-energy part of IceCube-Gen2 will enclose the current detector with ~140 additional strings each equipped with up to 80 optical sensors, thereby instrumenting 5-10 km3 of ice. Its main mission is the exploration of the high-energy universe with neutrinos. For the standard IceCube detector, we are working on reconstruction algorithms and various data analyses aspects. 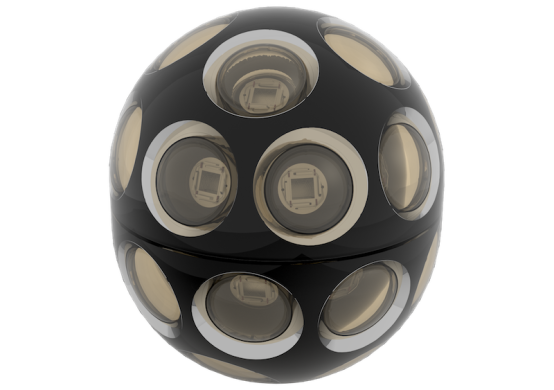 For IceCube-Gen2, we are developing an innovative new optical sensor (mDOM) which consists of 24 3″ photomultiplier tubes and provides significantly improved detection properties for Cherenkov light. In parallel, we are working on simulations of detectors equipped with mDOMs and are developing novel reconstruction algorithms.